In Which the Pirate Will Have to Start (Mostly) Over. Some time ago I started designing a pair of flip-top mittens to match the Moorefield Hat. Instead of knitting the glove first and then picking up stitches along the back of my hand for the mitten top, as I've done for all the Fleeps I've made, the plan for these was to knit the mittens first, including a strand of waste yarn across the palm, so that the colourwork could continue uninterrupted on the back of the hand. Once the mittens were done, I'd pull out the waste yarn and have flippy-open mitten tops, and I'd pick up stitches to knit the inside gloves. I got as far as knitting the whole mitten, with the thumb stitches held for later, and pulled out the waste yarn to work on the inner gloves, and... well... there were some issues. So I've ripped back to the cuff, which fits just fine, and I'm going to try again to make flip-top gloves - fingerless this time, I think - that match the Moorefield Hat. It'll have to be bigger all around, for sure. Maybe just going up a needle size would be enough... it will be an adventure, either way! Comments Off on In Which the Pirate Will Have to Start (Mostly) Over. In Which the Pirate Will Have Warm Hands. 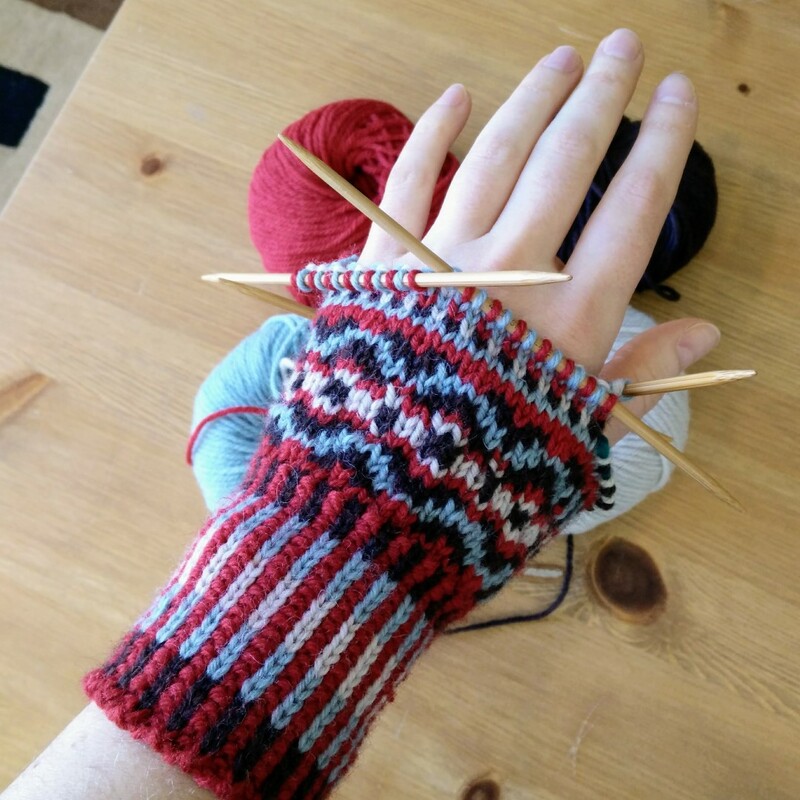 Moorefield Mittens (take two) - now with a cuff of a more appropriate length. I'm getting pretty good at the alternating cable cast-on, which is still a little fiddly but no longer frustrating to do. I like how the cuff looks with red as the consistent colour - it's a different 'feel' than on the hat, but still nice looking. The wonky stitch tension will even out with blocking; for some reason I have more difficulty with stranding on DPNs than on circular needles. 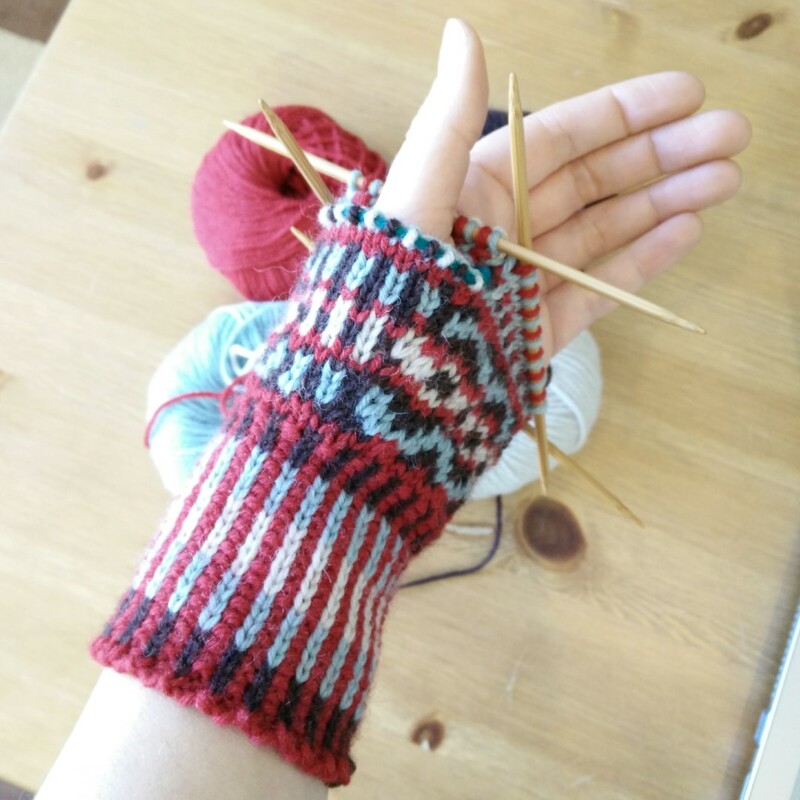 The thumb stitches are being held aside, and I'm up to the part where I'm going to create the opening that will make these flip-top mittens. This is accomplished by knitting a row of waste yarn across the palm, then continuing on in pattern. 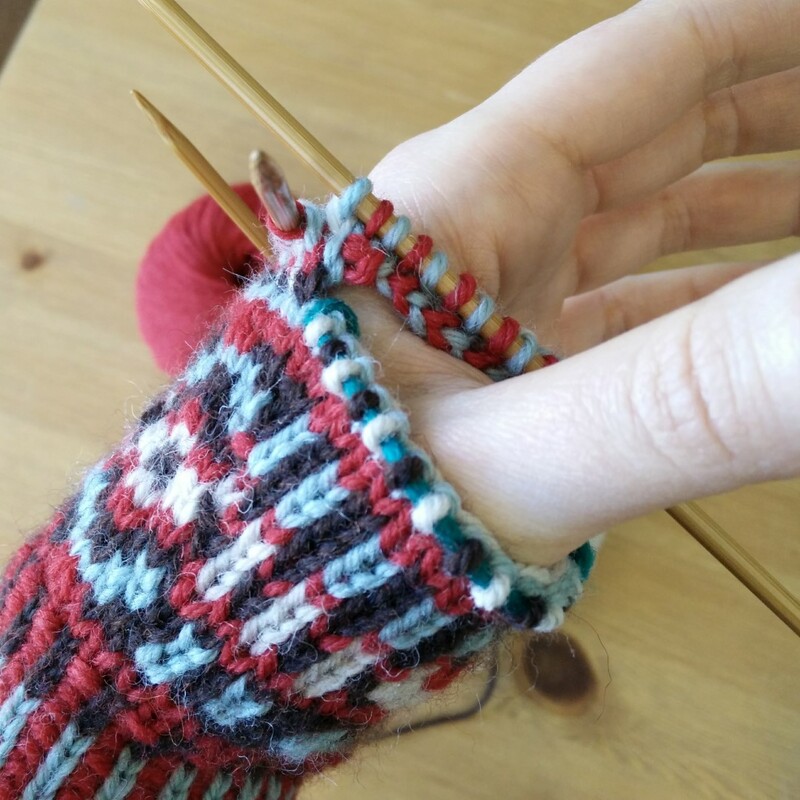 This technique allows the colourwork to progress uninterrupted up the back of the hand. When I made the Fleeps I knit the glove with fingers part first, and then picked up stitches across the back of the hand to make the mitten top. This time, the mitten top is knit first, and then the waste yarn across the palm will be pulled out to give me two rows of live stitches from which I can knit the glove fingers. I made the stitches across the inside of the thumb in pattern, though it's probable that they won't even show in the finished object. The thumb hole seems a little large, but that might be necessary for a range of motion. When I go to knit the thumb, I could decrease by picking up just one stitch into both "corner" stitches - where the stitches on waste yarn meet the stitches I cast on to bridge the gap. That would bring the total from 26 down to 24, which might fit my skinny fingers a little better. Conveniently, it might also help to prevent holes in the thumb! Comments Off on In Which the Pirate Will Have Warm Hands. In Which the Pirate Blocks the Hat. 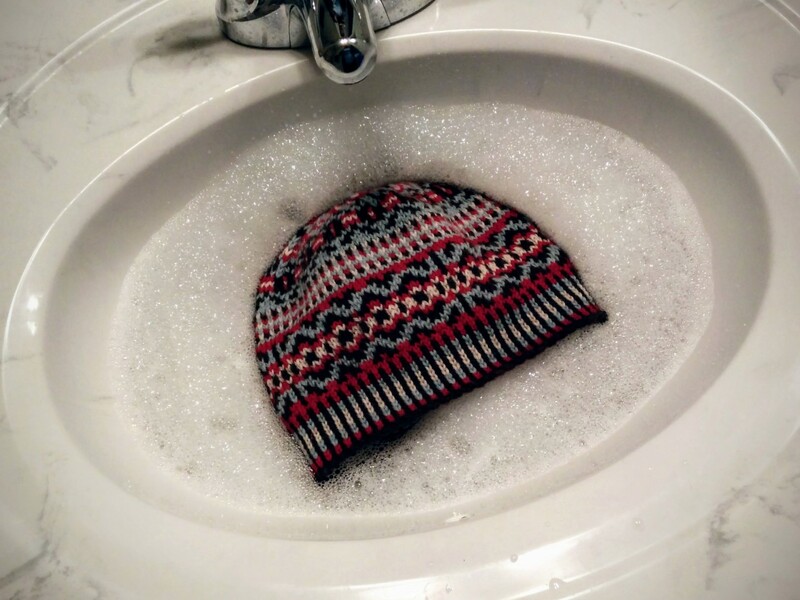 The hat has been finished for a while now. The ends woven in, the yarn put away (sort of - more on that in a moment) and the styrofoam head located. The hat, finished but unblocked, has been sitting on the styrofoam head in my living room, where I've been admiring it on a nightly basis. 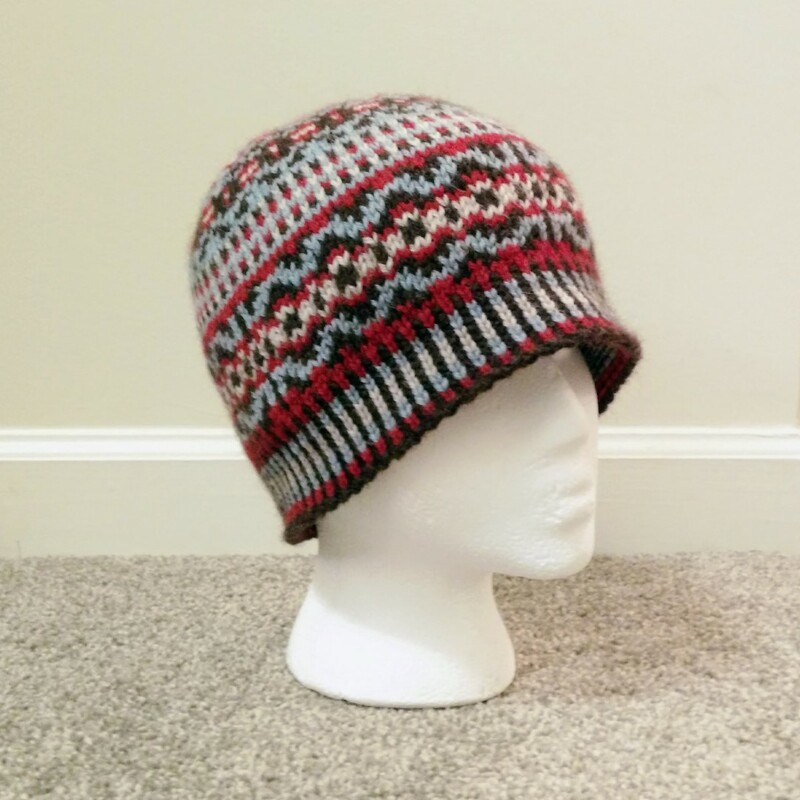 "But," I said to myself, "I can't finish writing up the pattern without pictures, and I can't take pictures without blocking the hat." ...and now it's back on the styrofoam head, its stitches far more even (especially around the decreases) and looking good. The head is actually too small for the hat, so it doesn't look as good as it might. I'd love to have a proper-sized blocking head. One day! It has a name now, too: I've decided to call it Moorefield. As for the yarn, which has been sort of put away (it's in a cubby of the coffee table), I might be making some matching mittens. I got started but then had to rip back; the cuff on these isn't nearly long enough. But they're pretty, so I'm sharing anyway. 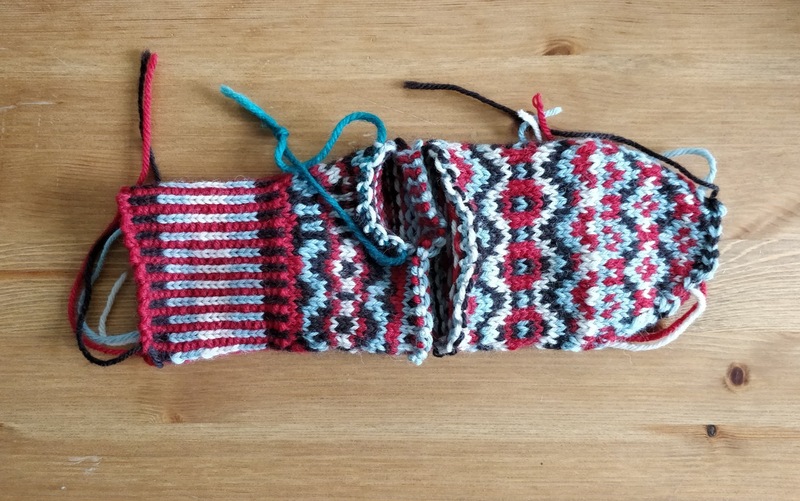 There might not be enough brown yarn left to make two full mittens, so I've changed the colours around in the chart to have the main stripiness be red instead of brown for the second attempt. 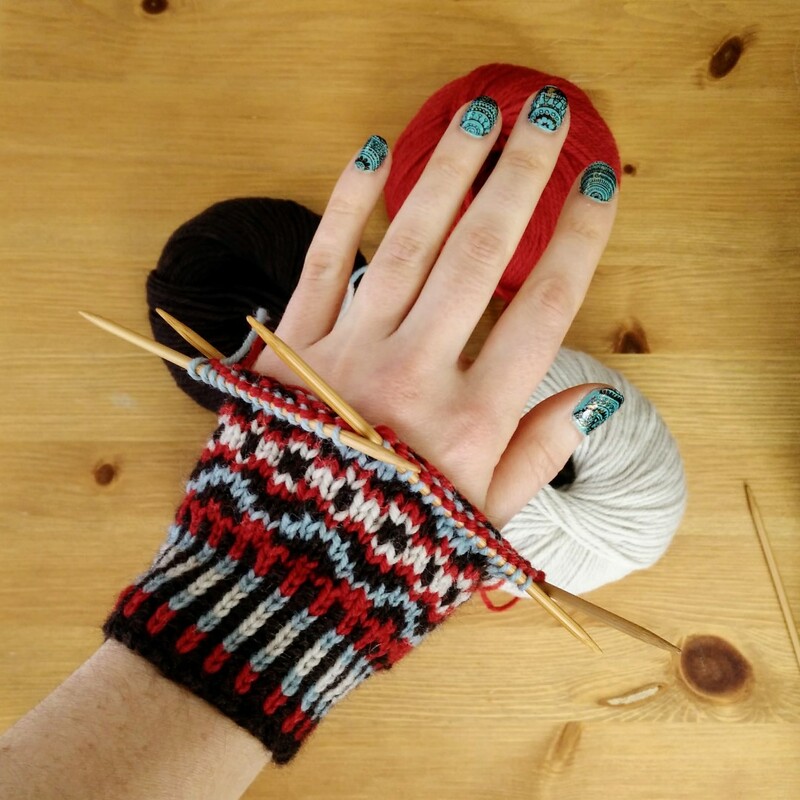 I'm also going to do these as flip-tops, because flip-top mittens are the best thing ever. If I really focus on them, I might be able to get them done and written up in time to release along with the hat. That's ambitious, but not impossible.